Welcome to the architectural edition of Photo Art Friday. As always, you are welcome to link up any piece of photo ART you wish, or you can follow the prompt and link up your photo art that relates in some way to architecture. I have chosen the latter and hope you enjoy viewing the minimalist architecture in these pieces of photo art! Half tree house, half play house - designed and built with care for the little folk. Look at those gorgeous exposed beams in the ceiling! And if you look closely, you will see it is even wired with electricity for late night pyjama parties. This photo, shot from/through the kitchen window, shows our grandaughters washing the tree house. At our behest? No. Absolutely not. I wouldn't dream of asking anyone to scrub raw, unpainted wood! They just felt it was not being maintained properly and asked for a bucket of soapy water with rags and brushes so they could bring the outdoor architecture up to their unusually high standards. All of the adults in the house had to pick their jaws off the floor! Adorable - if I do say so myself. a piece of photo art that features fencing. Worded that way, the prompt gives you a lot of latitude! Oh Bonnie I just love these photos! What a great spot for kids to have their pajama parties, or just to hang out and think! Really nice job! Great shot of the girls "scrubbing this down"! Bonnie, that is a DREAM house! No wonder the granddaughters want to keep it polished. 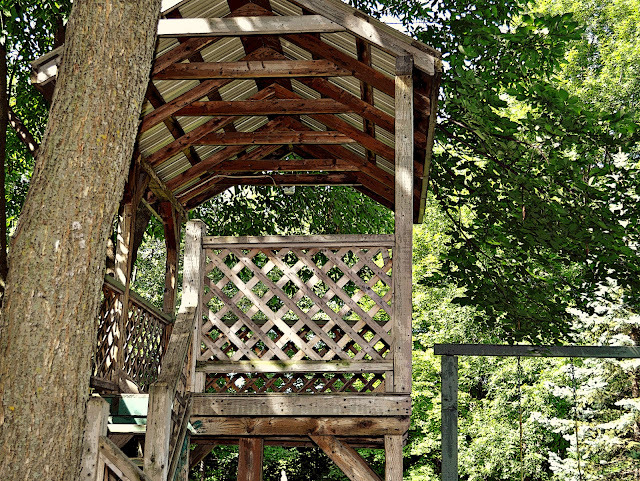 Love the play/tree house. It's bigger than the bedroom I shared at home until I moved out. lol Wonderful grandkids to keep it clean too :). No architecture piece this week, so I shared a portrait instead, but I definitely have one for fences next week ;). You're right, the girls are precious! I love the tree, BTW, not just the treehouse. I used your texutres in another piece, if you want to see it, you'll find it here. Thanks for another week of Photo Art, Bonnie! Oh, what a great house! Can I come over and play, too?! I had to sneak in another as I had totally forgotten about this old post. 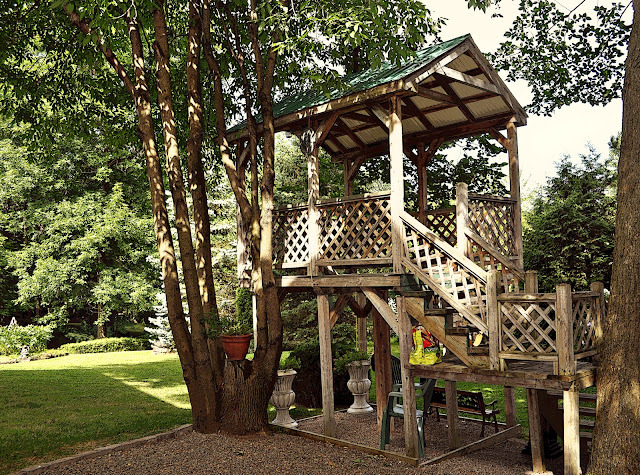 Gosh what a wonderful Treehouse/Playhouse. How sweet that the girls were helping to maintain it. I love that last shot. It has a real nostalgic feel about it. I love this. My neighbors(as a kid) had one of these and we would play for hours in there. I miss it. 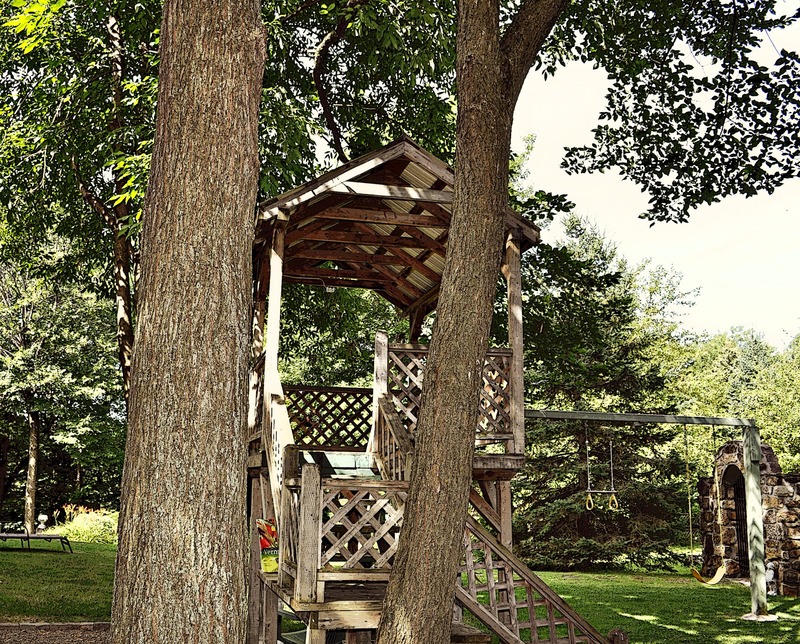 The tree house is adorable and your grandchildren are precious :) Thanks for the prompt, Bonnie! Oh I so would have loved a tree house as a child. Even as an adult!!! Enjoyed these shots. That is so cool! What great memories your grandchildren will have. Okay, so after visiting several of the participants I am so excited about experimenting with some of their ideas. Thanks for the inspiration!!! What a fun memory for them! Yes, very nice pictures, excellent play of light and shadows. Love your tree house! I remember havin a plank to the tree branch from the roof of the garage--and if our parents ever saw it, we'd not see the outdoors again until we were 30! Yes, I agree, Bonnie! 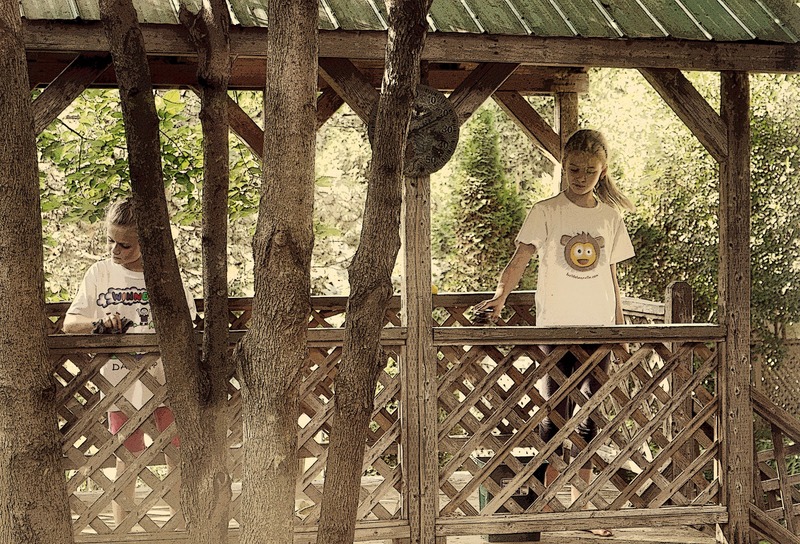 Adorable granddaughter, adorable tree house and adorable photos! Ett så underbart trädhus hade jag önskat till mina barn och barnbarn. Tack för din fina kommentar. I'm a little behind in my blog hopping this week. You always comes up with the best ideas!